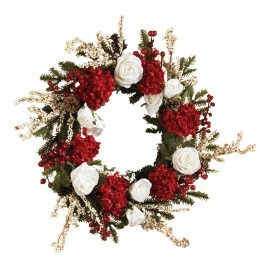 Alternating blooms of fire and ice adorn this lovely holiday sensation. A blend of delicately crafted berries sprouts forth from behind plush petals. The entire circumference of this gorgeous diadem is covered with lush green foliage creating a stunning design that’s second to none. At twenty four inches in diameter, this cheery, attractive wreath makes a splendid addition to your home or office décor. 18.75" x 19" x 6"